Reserving with Public Storage is always free. You'll never be asked for a credit card and there's absolutely no obligation. To learn more about the reservation process, watch "How to Store in 5 Easy Steps," and get up to speed on the basics in less than two minutes! When you reserve a unit, we hold the selected unit size, price and promotion for you until you're ready to move in. For your convenience, you can make your reservation up to 7 days in advance of your move-in date (depending on the location, this timeframe can vary). Reserve one unit, or as many as you need. There's no obligation and you can change or cancel your reservation at any time. With thousands of locations across the U.S., we're sure to be in the neighborhood. For your peace of mind, all Public Storage facilities are well lit and feature electronic security gates accessible only by our customers. Use the search feature to find all Public Storage locations closest to your home. Simply enter your city, state or zip code and you'll see we're practically right in your backyard. Reservation specialists are available to take your calls 7 days a week. Call 1-800-688-8057 with any questions (Call Center Hours). If you're ready, they can also make your reservation. 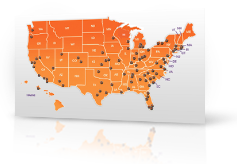 Use our Location Finder to view a map showing Public Storage locations all across the U.S. Click on any state, and then narrow your search by selecting the desired city and location. We offer storage solutions for just about anything imaginable. So whether you're looking to make more room in your home or extend your office space, we have the right unit for your needs. We can even park motorcycles, cars, boats, RVs — or anything else you can think of! Our standard sizes range from 5'x5' to 10‘x30' and our units are about 8 feet high.† Many facilities also offer smaller or larger spaces – everything from storage lockers to garage-like units. Try our Size Guide. and you're sure to walk away with a good understanding of the unit type and size that's right for you. Most locations offer climate-controlled units that have the benefit of maintaining a set temperature range. 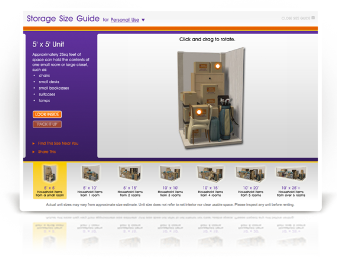 Be sure to select this unit type when your storage requires protection from extreme hot and cold environments. With their own spacious loading area and large roll-up doors much like a garage, these units are an excellent choice for overall convenience and frequent "stow and go's." Indoor units are located within our building, accessible by wide hallways, and can often be above ground level with elevator access. They offer protection from outdoor elements and can be climate-controlled. Outdoor units are at ground level and offer drive-up access with roll-up doors. Their interior temperatures are often similar to local weather conditions. †Actual unit sizes may vary from approximate size estimate. Please inspect any unit before renting. Prices vary based on location and the unit features selected. We often provide online discounts and other special offers, so please refer to the quoted price shown when making your reservation. For most units you'll pay just $1 for the first month's rent^. That's our way of saying thank you and welcome to Public Storage. You may also choose to purchase a lock, insurance, or moving supplies. These additional items—as well as any taxes and a nominal one-time administrative fee—will be included in your first payment. When you make your reservation online, you'll always get our best discount and lowest price for your unit. Occasionally, we provide other offers and discounts for both new and existing customers, so be sure to check back often. At Public Storage, we use only month-to-month leases. This means you get to decide how long you stay, and you can move out at any time without the hassle of long-term commitments. Reserving your unit is always free. And fast! Just submit your online reservation now to secure a space and lock in the savings with a discounted price. Or, if you have any questions, call a reservation specialist at 1-800-688-8057. You can even stop by any Public Storage location to reserve in person. There's absolutely no cost when making your reservation, and we never ask for a credit card. Should you later decide you're not quite ready for storage, no further action is necessary. The only information we ask for is your name, email address and telephone number. You can make unit size and location changes at any time by managing your reservation online. Change your move-in date if you need more time to pack, or cancel your reservation and start over again when you're ready. It's always in your control, and it's always free. After reserving a unit, you will receive a confirmation email showing your reservation details. Your property manager will also call to confirm your reservation and answer any questions you may have. To learn more about your move-in day and what to expect next, be sure to visit Moving In.